Looking like someone famous is a fun party trick, and it definitely makes Halloween a lot easier. But it can make everyday errands – like going to FedEx – a lot more difficult. One man – who is apparently in California – has taken it upon himself to stop the questions and make his life a lot easier... or at least a bit funnier. 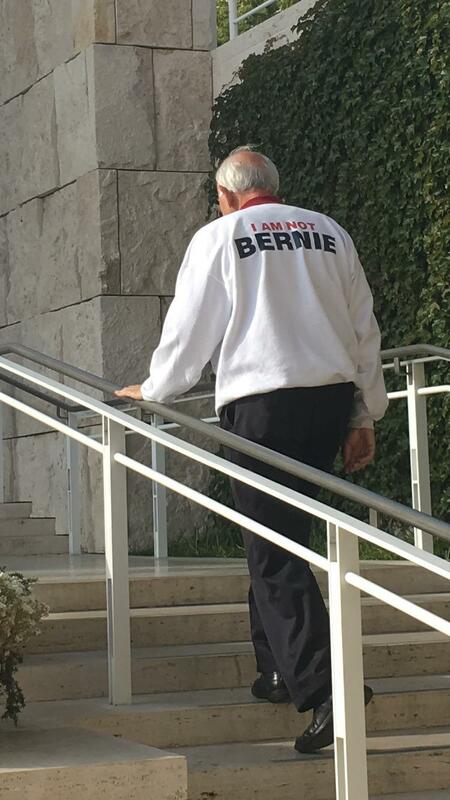 Reddit user Dasbeardog posted this picture of a man spotted in a FedEx location who was wearing an "I Am Not Bernie" shirt. Other users soon joined in on the conversation, sharing other sightings of men wearing "Not Bernie" shirts. The users argued over whether the photos were of the same man or not, noting that the spacing between the words was different in the photos. Perhaps there are a bunch of old white guys walking around, telling everybody they're not Bernie Sanders. Then, user edogman9955 posted a picture saying that not-Bernie stopped by his campaign office. I mean, they both kinda look like old white dudes. I could definitely mistake the two from a distance. Not Bernie was in my work a few weeks ago! His face is also very Bernie-esque, same style glasses and everything. He's a super nice dude! We talked for a little bit and he told me how he went to a Bernie rally in Santa Monica and was asked to take hundreds of pictures. There have to be some floating around the internet. And then, user caligoombah posted a gif from a real Bernie Sanders rally in Santa Monica on May 23. The user said not-Bernie was "hamming it up with everyone" as people gathered to take pictures. According to another user who claims to have met not-Bernie, the man was a Republican. He came around to Bernie Sanders eventually, although it's unclear if this was due to the resemblance or not. Either way, it just goes to show how the power of the internet can bring people together to make awesome discoveries.